Just a little clarification on CSPS Endon. 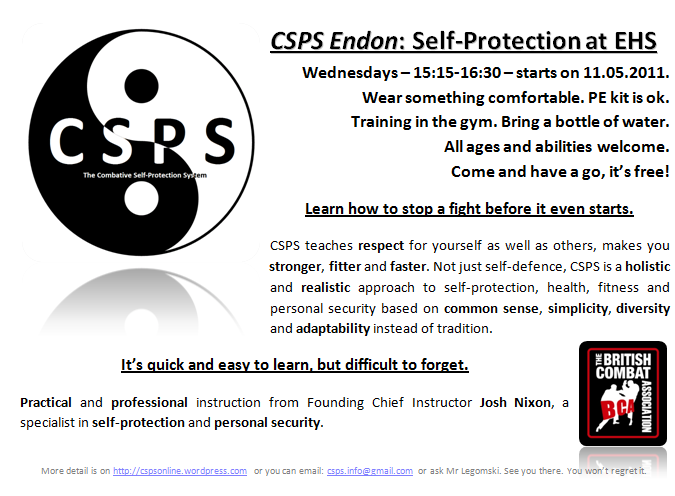 The class is starting on Wednesday, 11.05.2011, and for eight term-tie weeks we’re offering you training for free. You can literally come along and train every time for eight (term-time) weeks without handing over a penny. After that, it will cost just £3 per student per lesson. No joining fee. No monthly fee. Just £3 per lesson. So starting from Wednesday, 13.07.2011 classes will cost £3 per student. This class is exclusive to EHS students and teachers (though this could be subject to change in the future, so keep your eyes on the updates). Come and have a go, it won’t cost you anything! In fact, I’d recommend that you do while the exams are on, even if you hate it and never come back. Exercise is the best remedy for stress – when I had my GCSEs, I actually trained more than usual because I was getting stressed. As a result, I was chilled out in the exams themselves, and they went much better than I expected. I’m digressing anyway – come and have a go, you’re all more than welcome. It’s fun and friendly; we’re not recruiting an army, despite the fact that much of the training is derived from various global special forces! Respectful but fun too is how I’d describe the atmosphere we train in. I’m well-known for my bad jokes though, so I’ll warn you about those right now. See you next week! Any questions then feel free to email us at csps.info@gmail.com or ask Mr Legomski, Mrs Hughes or Jacob Nixon in Y7.